Dark chocolate cravings happen all the time and the good news is we have the answer. 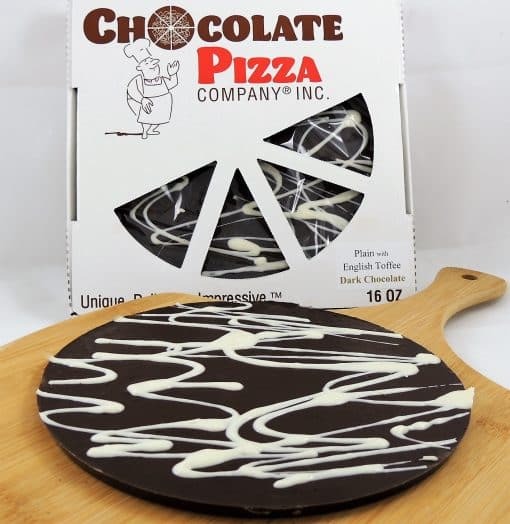 When you see what’s in our Dark Chocolate Cravings Gift Basket you know why this is one of our most popular items for anyone who enjoys a grand assortment of gourmet treats. 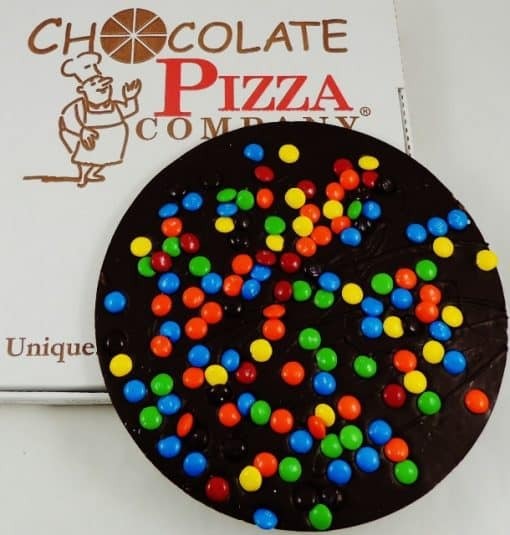 Anchoring this mighty collection of rich dark chocolate favorites is a 16 ounce Chocolate Pizza® with your choice of toppings, then we add Peanut Butter Wings® (8 oz), chocolate covered pretzels (6 oz), Caramel and Nut Drumstick, Peanut Butter Sparkler, pecan/cashew Cluster, chocolate covered graham crackers, and 2 chocolate covered sandwich cookie. Over-wrapped with a seasonal bow for a beautiful presentation. 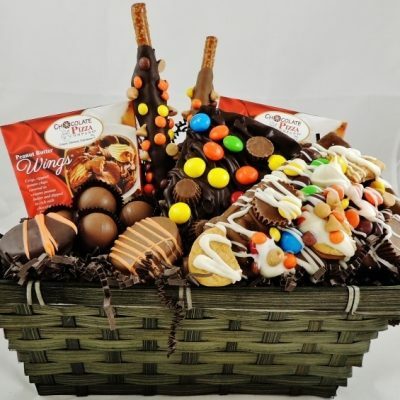 Whatever the occasion, this Dark Chocolate Cravings Gift Basket is unique and impressive. 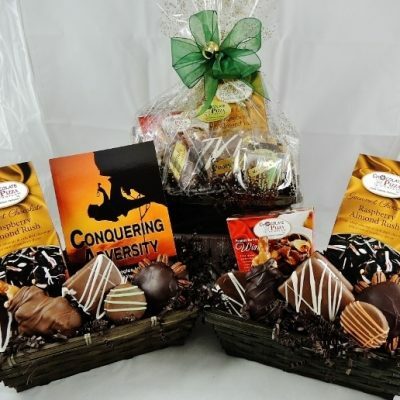 Dark Chocolate Gift Baskets is for those who want their chocolate dark, rich and smooth. 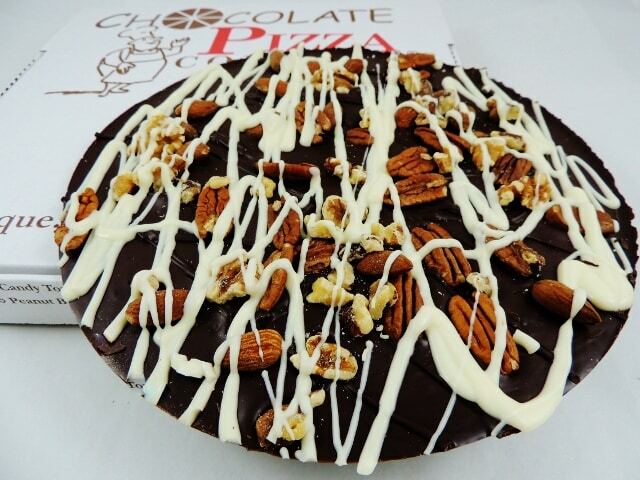 It gives legions of dark chocolate lovers everywhere reason to celebrate. 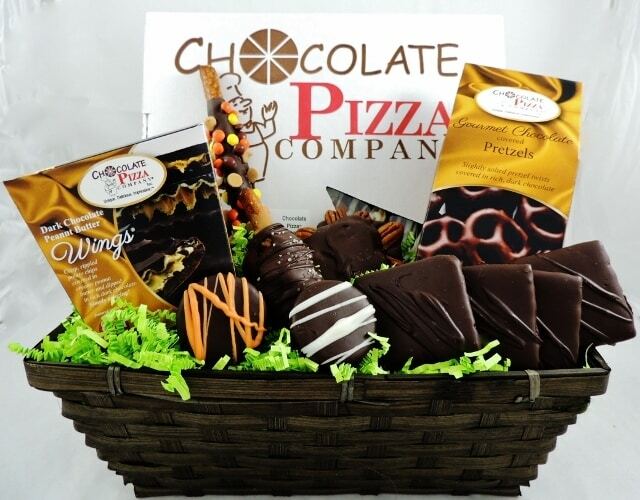 If you crave the elegant, sophisticated taste of a quality dark chocolate, then we have created your gift basket. Every treat in this Dark Chocolate Cravings Gift Basket is handcrafted with our very special dark chocolate – from the Caramel and Nut Drumstick to the Peanut Butter Wings to a delicious pecan or cashew Cluster made with smooth, chewy caramel. But best of all, this gift basket satisfies those chocolate cravings with a 16 ounce dark Chocolate Pizza with your choice of toppings. 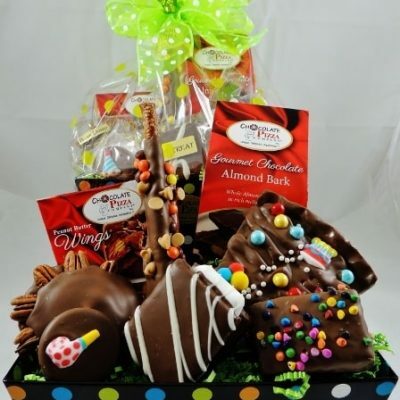 Beautifully presented with over-wrap and bow this Dark Chocolate Gift Basket arrives ready to impress and delight the chocolate lover in your life.